Specialty Shoes in CrossFit: What’s the Goal? Since the creation of CrossFit, a central focus of CrossFit methodology and philosophy has seemed to involve returning to a primal human state. Mostly this comes from the Paleo Diet that is doctrinally ingrained in CrossFitters across the board; and while diet may have been the initial driver of the desire to return to the primitive, it has crept into other areas of life as well. One area that I want to talk about is that of Biomechanics. We live in a culture of enhancement; dietary enhancement (supplementation), performance enhancement (supplementation and equipment) etc. Although these enhancements might temporarily increase health or performance, eventually, the improvement will plateau and cause us to seek out further enhancement, thus facilitating an endless cycle of always looking for the next best thing. This perpetuates a dilemma for every person by never being satisfied. Ultimately we will all find that a return to the ‘primal’ way of life (with some exceptions and comforts) is the solution that can be both acceptable and sustainable. The endorsement of the Paleo diet in CrossFit is the nutritional answer to the dilemma, with a focus on very clean eating and whole foods, and avoidance of sugar and processed junk. I believe that the same reasoning should be applied to the way we train, with a specific focus on foot and ankle biomechanics. The inception of the modern running shoe was created with a raised sole to cushion a heel-strike gait and theoretically lengthen one’s stride, and thus increase speed. This idea propagated and shoes got more high-tech and cushiony; additionally more injuries were occurring. Other sports and activities followed suit with specialized shoes. Basketball shoes got more sole padding, high ankles, and reinforced sides. Lifting shoes got solid soles with raised heels. Each example above offered an enhancement to performance and training in the given sport. For many, the benefits gained are worth the enhancement. It makes sense for a football or soccer player to wear cleats because they will increase performance in the sport they are training for. The same could be said for any specialized shoe in any sport: rock-climbing, cycling, bowling, power-lifting, ice skating, dancing, and the list goes on and on. CrossFit labels itself the “Sport of Fitness,” and the goal is functional fitness, or being a “jack of all trades and a master of none” when it comes to fitness. CrossFit describes itself as “constantly-varied, high-intensity, functional movement” with the goal being increased “work capacity across broad time and modal domains.” So if the goal of CrossFit is improving/not sucking at life, doesn’t it make sense to train in a way where we are not constantly looking for an enhancement/ short-cut? Even within CrossFit we are starting to see a lot of the athletes use Olympic lifting shoes for weight centered wods; but in doing so, aren’t they training for a strength bias? (Certainly, athletes will not wear their lifting shoes all the time, and what will happen if they are used to wearing a lifting shoe, and something happens in “real-life” when they are wearing a pair of flip-flops?). This reason, I believe, is why we are seeing that more and more CrossFitters are looking toward minimalist shoes like Vibram, Inov8, and Reebok Nanos. And while I believe that minimalist shoes are the way to go for CrossFit/Life training, each of those listed above has strengths and weaknesses. Coming from the angle of a pro-minimalist shoe wearer and advocator, I have used a lot of shoes for standard cross-training shoes, bare feet, Vibrams, and Inov8s, I have found a shoe that I like more for CrossFit than those listed above, and believe it or not it is a running shoe. 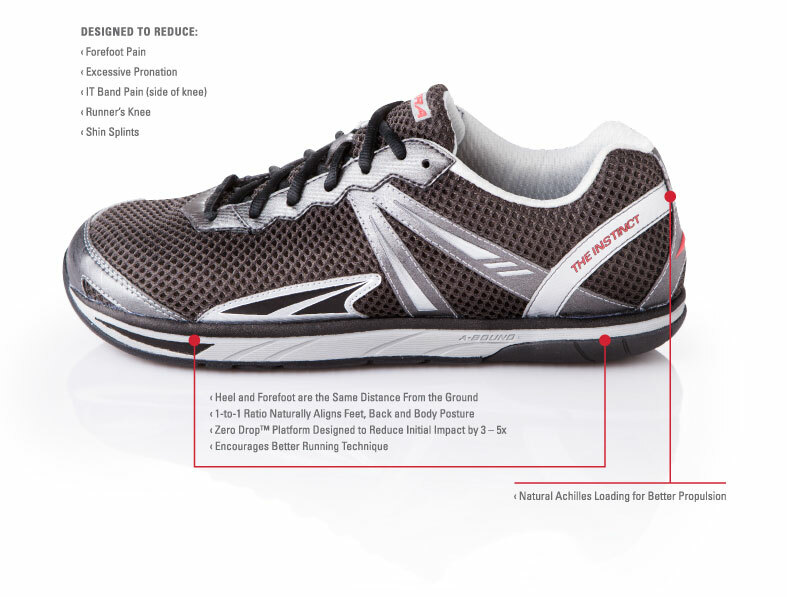 Altra shoes (www.AltraZeroDrop.com) were designed to enhance biomechanically correct running gait. They are designed with the heel and forefoot on the same level. And while they are gaining traction in the running world, I love them for CrossFit for a number of reasons. 1) They are comfortable. 2) They have a wide toe-box which allows the toes to move and react naturally without being compressed from the sides, and while the toes can move independently and comfortably, they still can work synergistically to generate force having the same sole (which is one of the reasons I don’t necessarily love five-fingers). 3) Because they are a running shoe, you can feel comfortable running any distance that you will ever see in a CrossFit wod. 4) They are zero-drop shoe which enhances correct movement biomechanics across the board, and decreases the chance for both chronic and acute movement-related injuries. And while they are zero-drop, there is more sole padding than other minimalist shoes which make them more comfortable for running, box jumps, power lifts that use a jump, dropping off the pull-up bar etc. 5) They are durable. Because they were created and developed as high-mileage running shoes, they last longer than other minimalist shoes. Ultimately I have found that my Altras enhance CrossFit/life performance, without having to make concessions elsewhere. If the key goal of a CrossFitter, or any other sport athlete, is one-dimensional, by all means, wear shoes to enhance the performance of that sport or event. But if the goal is to increase ability and functional fitness, where training shoes that will enhance your sport, and every other part of your active life. I’m looking to get a minimal shoe for crossfit but I have been dealing with plantar fasciitis. I have become aware that padding in the heal area is not the answer but to elevate the arch of the foot. Do these shoes accomplish this, or will the shoes further exacerbate my plantar fasciitis. I sprained my ankle doing box jumps and double unders after buying Reebok Nano 2.0’s. It didn’t all happen at once, but resulted in a week of built-up strain, slowly tearing away at the muscles until I found myself limping after a WOD that involved box jumps. I severely sprained my ankle 15 years ago and had slowly built up confidence since starting CrossFit 6 months ago. I had no issues with my ankle until I strapped on the Nanos. Before I was wearing New Balance running shoes. I blame the lack of ankle support in minimalist type shoes. Now I have $110 paperweights. An ankle brace is not the answer, but I will have to do something to assist me during WOD’s while I work to re-strengthen my ankle muscles. What type of CrossFit friendly shoes do you recommend for someone who needs some ankle support, but maintained ankle mobility? If it is an inversion/eversion strain, or stability issues that stem from an inversion/eversion strain, and you don’t want to wear and ankle brace, I would look at some Chuck Taylor Converse. They have support without all of the extra cushion and “comfort” fit of other training shoes. Although the shoes I blogged about have a very wide footbed and they are nearly impossible to roll you ankle in. Yes, box jump and double-unders lead to the injury. The pain is located on the outside of the ankle (right foot, right side). Definitely an inversion. I had been stable with no issues for the past 5 years until now. It is not that I rolled my ankle so much as the Nano has literally no side support. There is hardly anything there to support your joint when you jump and land. The Nano absorbs very little of the force and your joint takes the beating. Now, I weigh 230 lbs and I am doing 24″ box jumps. The shoes I had been wearing are NB 1226 running shoes. They provide quite a bit of bracing/support on the ankle and have a very thick heel. I had no ankle issues while wearing the 1226, but they are terrible for Olympic lifting. What do you think about the Merrell Mix Master mid-height shoe? Thanks for any advice. What is CrossFit’s Obsession with Full Range of Motion all About? Creating an arena for the urban athlete. Run, Bike, Row, Lift, Swim, CrossFit, Eat, Pray, Sing, Play - get fit!